You may hear the dentist talk about composite, glass ionomer and compomer- these are different types of white filling. Unlike silver (amalgam) fillings, white filling material sticks to teeth and can form edges, so it may be effectively used to repair front teeth that are chipped, broken, decayed or worn. It can also be used as a veneer to cover marks or discolouration that cleaning won’t remove. 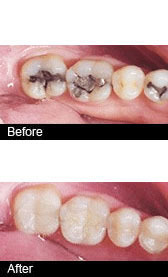 White fillings can sometimes be used in back teeth if there is not too much decay or damage. The NHS will not currently pay for white fillings to be placed on biting surfaces in back teeth. This is because white fillings are less durable than silver fillings under the wear and tear of chewing. White fillings are also difficult to place in back teeth, as they need very dry conditions, which can be hard to achieve right at the back of your mouth. 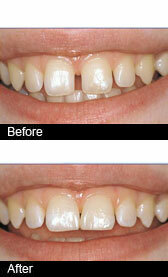 Please contact us to find out more about white fillings and book your consultation.